To make automatics updates from Stone Edge to Woocommerce it is necessary to set which events should be triggered. There you will see the list of events you can select to notify Woocommerce. You will also see the Order/Item status you can automatically assign when each event happens. Store name: The name for this shopping cart. Cart ID/User Name: Username you will use to connect to the site. The same one needs to be set in SEOM WooCommerce settings. Password: Password to connect with to the site. Same as above, this one needs to be set in SEOM WooComerce settings. Script URL: Your WooCommerce site URL where the SEOM plugin is installed with the entry point path ‘/di-seom/entrypoint’. Download the plugin and upload it to your webserver via your favorite FTP application. The WordPress codex contains instructions on how to do this here. Be sure that you already have WooCommerce installed and activated before running the plugin. If you haven’t already, please install and activate WooCommerce first. Plugin updates are regularly uploaded. Updates are only available for valid license keys. If you have a valid license and there is an update available, it will be displayed in the list of plugins. 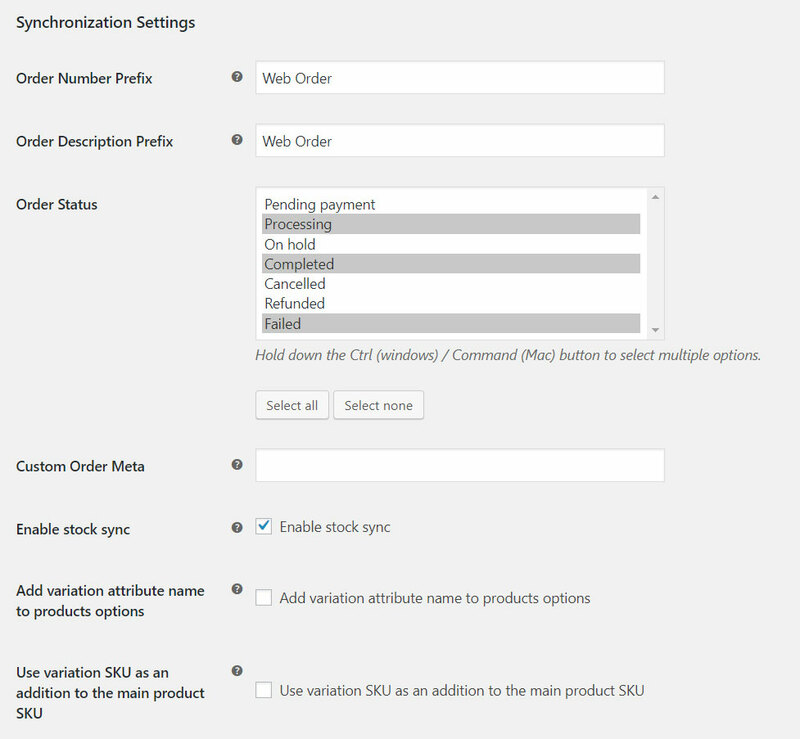 When you’re in your site’s admin dashboard, navigate into the WooCommerce settings page. 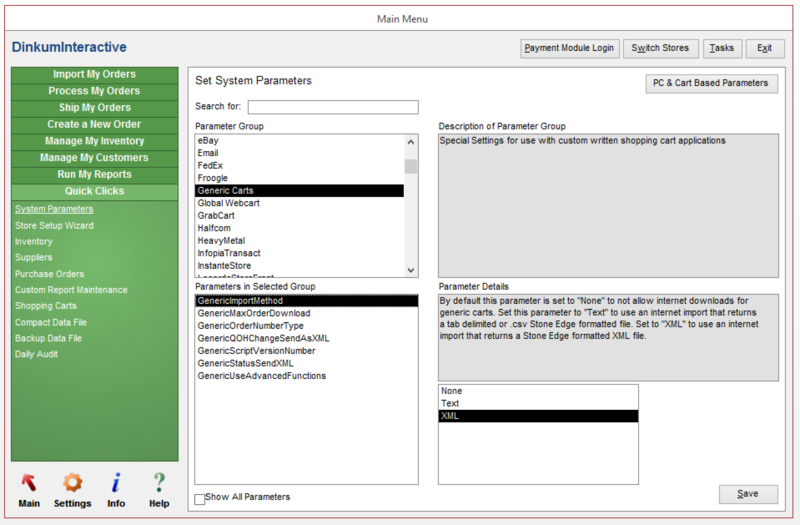 Inside the integration tab, you can find the plugin’s setting page. Enter your license key to receive future updates. 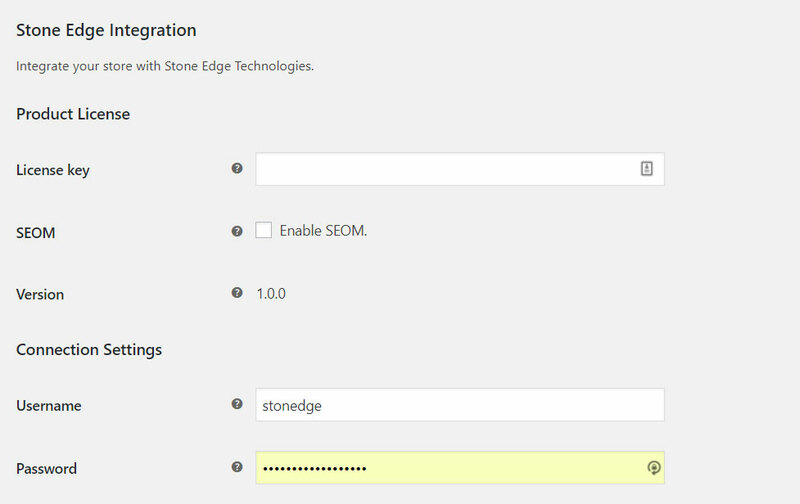 Checking the “Enable SEOM” box will allow your site to communicate with the StoneEdege app. If this option is unchecked, all features from the plugin will not run. Username is set in the Cart ID / User Name field in Stone Edge Shopping Cart. 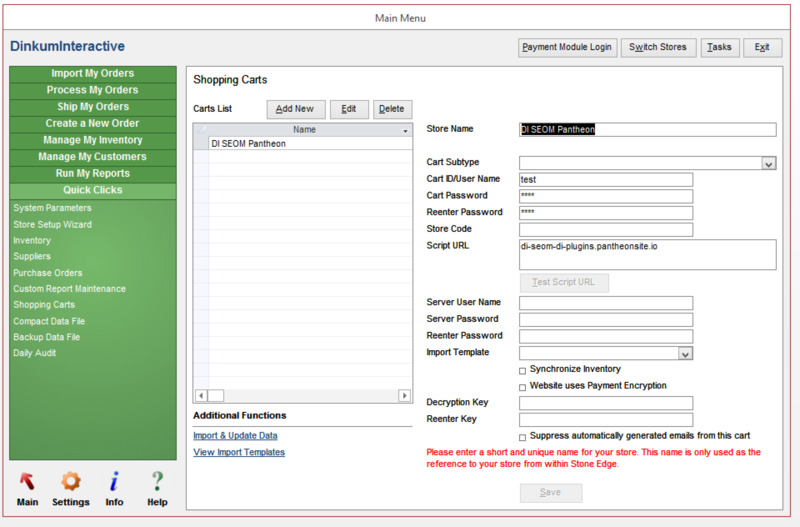 Password is set in the Cart Password field in Stone Edge Shopping Cart. This field is used if you use or want to use a prefix in the order numbers you send from Woocommerce to Stone Edge. This is the same as Order Number Prefix but is used for order descriptions. 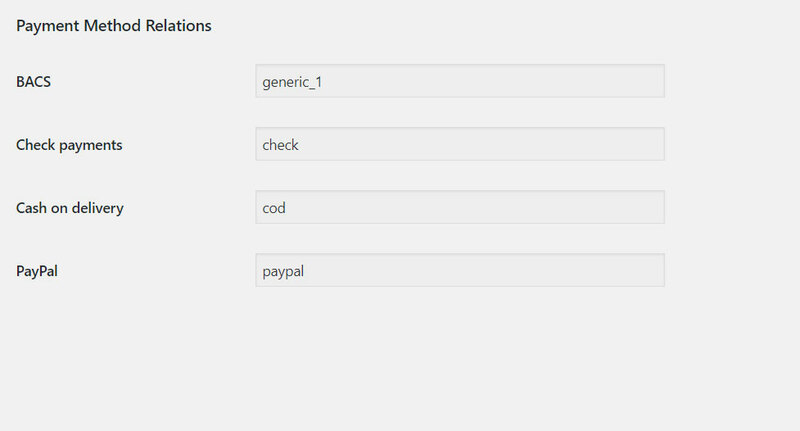 This is the order status you select to sync when an order is made, you can select all orders statuses you want to sync from Woocommerce to Stone Edge. If you have an active custom ordering plugin, you’re going to need to provide the ordering meta name. 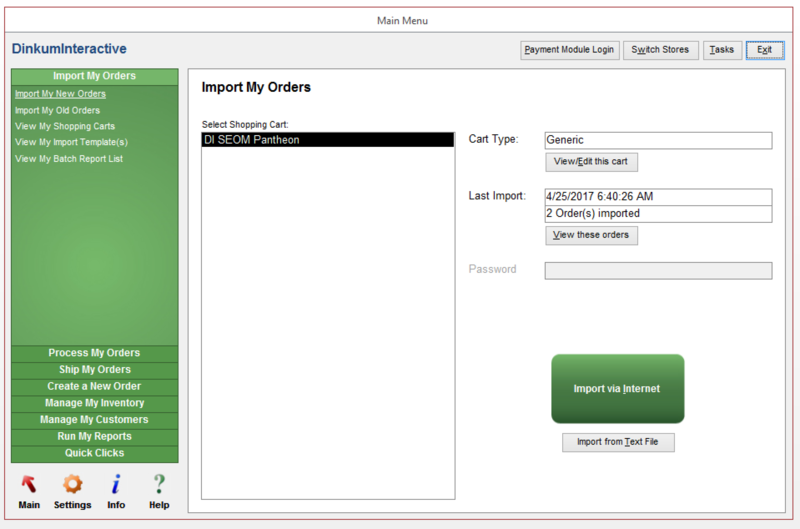 This will ensure orders exported to the order manager are sent in proper ordering. If enabled, products stock will also be included in data transfer. 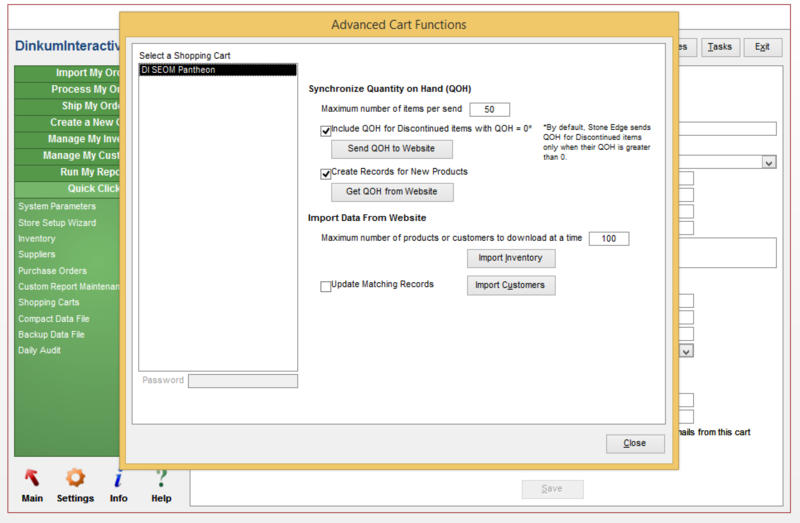 This will enable your order manager to reduce products accordingly. As Woocommerce and Stone Edge are different systems, we could have the same payment methods but with different names or labels on each system. We will need to relate the payment method in Woocommerce with the appropriate payment method in Stone Edge. On the left side you will see a list of payment methods in Woocommerce while on the right the option to select the payment method it represents in Stone Edge. As Woocommerce and Stone Edge are different systems, we could have the same shipping methods but with different names or labels on each system. As in payment methods we will need to relate the shipping method in Woocommerce with the appropriate shipping method in Stone Edge. 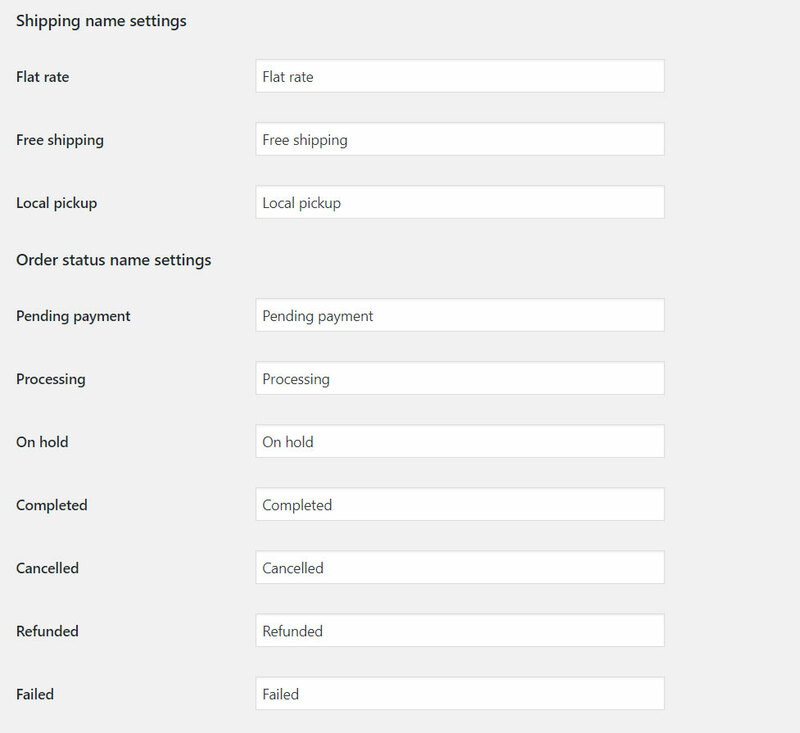 On the left side you will see a list of shipping methods in Woocommerce while on the right the option to select the shipping method it represents in Stone Edge. Click the first menu item on the left will bring you to the “Import My Orders” page. Choose `Import My New Orders` to start importing. To start importing the orders from your website you need to select the shopping cart created and click in the “Import via Internet” button. After all orders are imported a successful message will be displayed with the total orders and total amount imported. If it is the first time you are importing orders from Woocommerce to Stone Edge, the functionality will be like the mentioned in “Import My Old Orders” section. So if you use the “Enter Order Number” field for example with the value “232”, the import will set all orders as “Shipped” from the order number starting at “233”. If you use the “Enter Start Date” field, for example with the value “20-Oct-2017”, the import will set all orders as “Shipped” from the orders created on “21-Oct-2017”. From the Main Menu, use the quick clicks link to open your shopping carts settings. Located at the bottom left, you can find the `import & update data` link, click it to open the advanced cart functions window. This option will process all products in Stone Edge and stock values will be sent to the website to overwrite stock values on it, the match is made by Main product or variable SKU.